Today, despite having a pile of work to get through, I dragged myself to gym. When things get hectic and everything you have to do seems overwhelming, that's often the time where relaxation and structure are most important. I tend to let all else fall by the wayside in an effort to "focus" but all that does is leave me feeling frazzled and tired. ANYWHO, speaking of focus. So today's positive moment happened at said yoga class. We were ten minutes in, and I felt stiff and uncomfortable (which is in stark contrast to the relaxing happy place it usually is), when the instructor said. "Yogis! I hope that you all left Ego at the door." She was referring to a couple of women who were doing advanced moves before she had finished taking us through the basic, but what I took from it was that so often we see our bodies as something we need to change, and exercise as the means to that end. However, one of the reasons I love yoga is that it's possible to forget about that scary bikini sitting in your cupboard and relax into the moves, forgetting the outside world and its influences for a while. If you bring ego into it, you lose that calm because then it's back to comparing ourselves to others, smiling proudly to ourselves when we hold a balance longer than the person next to us, wondering how each move is toning the relevant body part. No thanks. 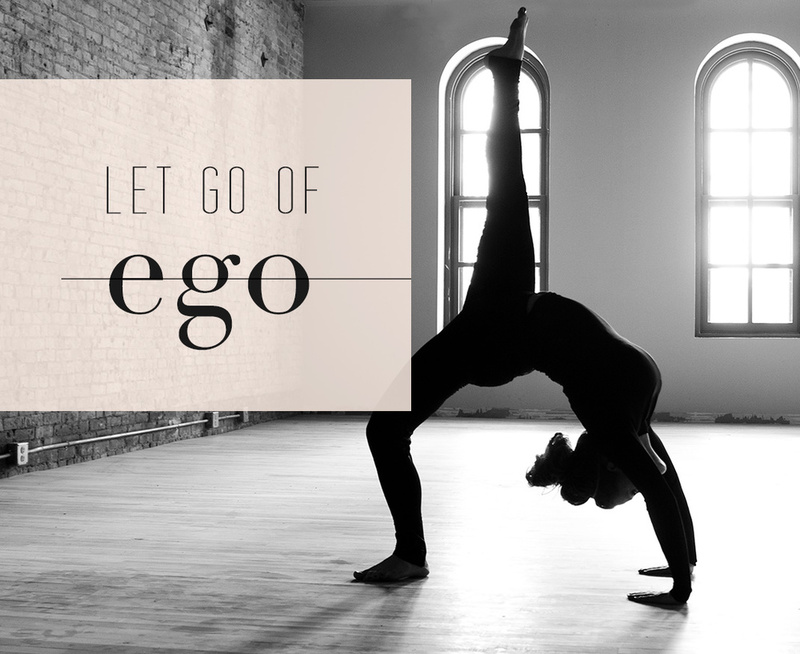 If we could just let go of that pesky Ego, how much free-er and happier we would be. (Think Phoebe in f.r.i.e.n.d.s running through Central Park like a crazed spider.) We should try to be mindful, aware of where our thoughts are taking us. Go on, be a better human. Namaste: The light within me honours the light within you. Sources: image 1, Designs: my own. Quote origin: unknown. We all need to remember this. I'd like to focus on lettering this week, starting with this awesome piece by Molly Jacques. I took part in a great Skillshare course on drawing illustrative words with Neil Tasker (I say took part because with work pressures I haven't had a chance to complete it.) I'm really enjoying learning and challenging myself and having always loved typography, it's been so great to learn the differences between the arts. I'm going to share some work I find inspiring (like this) and if it works out, perhaps lettering can be a regular column here. Happy Monday, readers.